When I was pregnant, I thought I'd never be able to decide on a doctor that would essentially be responsible for my child's health and well-being. Of course, as a parent, it's my responsibility to make sure my baby is healthy and developing accordingly. The pediatrician, however, is the one that helps guide me as a parent in raising my daughter in the best way I can. In general, all pediatricians are expected to diagnose an ear infection, suggest vaccines & tell parents if their baby is within the percentile range for their age. What sets apart a good pediatrician from an average one, however, is one that offers emotional support, helpful advice and is a sounding board for all of your natural paternal concerns. Even while still pregnant and months away from delivery, I wondered what I would feed my baby, how often, what signs to look for that she's not feeling well, how long she should sleep, etc, etc..... I needed a pediatrician that could answer all of those questions for me and more. For this reason, I needed to find a pediatrician for my daughter that would be a good fit for me as well my daughter and my husband. 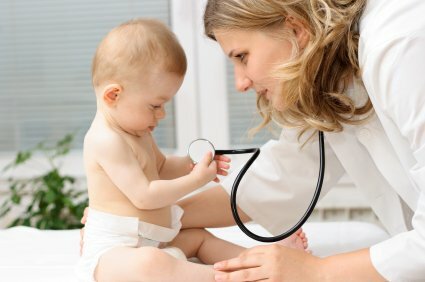 While it may seem easy, since there are hundreds of pediatricians available in most insurance plan, finding a doctor that meshes well with your family BEFORE baby is born is the tricky part! Without meeting them and seeing how they interact with your baby makes, it difficult to see first hand what type of doctor they are. So, you'll have to do your homework and find a doctor with a personality that works well with yours. You'll have to speak with him, either in person or by phone, and ensure that he or she is dedicated to spend the time necessary with you, regardless of the number of questions you may have. As a new mom or dad, you'll have many many questions and you'll want someone that answers each one throughly enough and explains further if you still need clarification. Of course, the best way to do this is in person, however, some offices only allow phone interviews for expecting moms. Whether it's in person or by phone, be sure to ask the right questions so you make an informed decision on the doctor that will be treating your kids. Are you certified by the American Board of Pediatricians? What is your specialty, if any? What is your schedule? Hours? Night calls? How easy/difficult is it to make appointments with you? Wait time? What is your stance on vaccinations? Where do you stand on breastfeeding, medications, circumcision, etc? What are well visits like? How long is the appointment? What does the visit consist of? How often? Do you accept/respond to phone calls if an appointment is not possible?